My twin daughters and I made this cake for their sweet 16 birthday party. This was our first attempt at marshmallow fondant. We were extremely please with the result and had a blast creating this together. The top layer is a chocolate cake with buttercream icing beneath the fondant. The bottom layer was french vanilla cherry chip cake. We decorated the homemade sweet 16 cake with polka dot sugar decorations and topped it with silk daisies. Awww, this is such a great looking and its home-made!! The best bakery in town couldn’t make it that great. And for whoever’s birthday cake that was HAPPY BIRTHDAY!!!!! 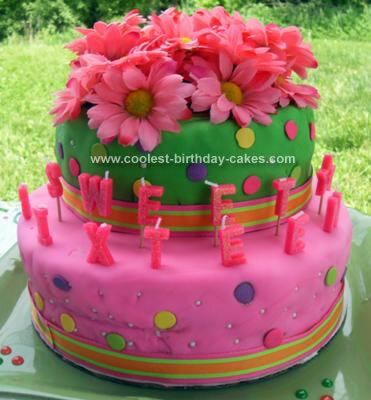 i love that cake its beautiful!!! and HAPPY BIRTHDAY!! !